Meet Planet Hollywood’s Latest VIP Celebrity Guest; you’re just a coach ride away! As always, the Planet Hollywood atmosphere promises to be awesome. Throughout the restaurant are 18 huge multi-purpose plasma screens playing the most nostalgic Christmas themed movie and music clips. And occasionally the restaurant’s roving cameras take over the screens and diners enjoy their 15 seconds of fame as they and their party of friends appear live on screen. There’s even a personalised messaging function where guests can have their merry greetings displayed around the restaurant on every plasma screen. 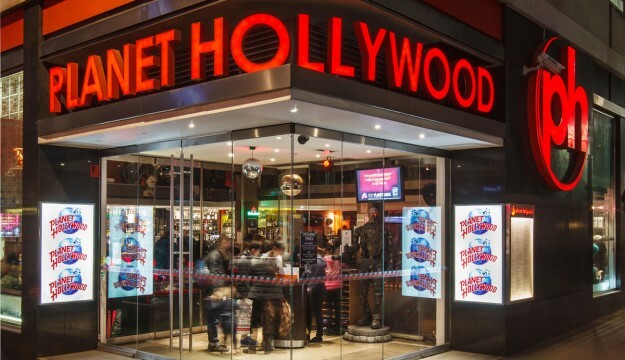 And if all that tinsel is too much, then check out the amazing Hollywood eye-candy: Planet Hollywood London is home to over 60 pieces of iconic Hollywood history including real props from Star Wars, Halle Berry’s famous ‘Jinx’ orange bikini from Die Another Day and ‘The Hoff’s’ red shorts from Baywatch.